This timeslot was easily the toughest choice of the festival for me, with John Ford’s How Green Was My Valley in the El Capitan with Maureen O’Hara in attendance vying with a specially curated program of John and Faith Hubley animated shorts introduced by Leonard Maltin (among other tempting things, but those were the most tempting for me). Neither one is likely to be repeatable. I’m not usually a star-watcher and I rarely choose TCM Fest screenings based on the guests, but I finally decided that I’d regret missing the chance to see a 94-year-old Maureen O’Hara more and headed over to the El Capitan line super-early, because the buzz going around was that this was going to be a HOT ticket. And that was certainly true – I got there an hour early, and I was somewhere around number 260 in the passholder’s line. Every seat was full in the 1000-seat theatre. The love for O’Hara as soon as she came on the stage was just about overwhelming. 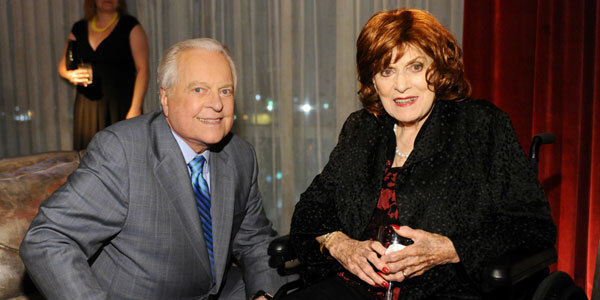 I was up in the balcony, far from the stage, but looking at the press photos later, she looks pretty great at 94, eh? Robert Osborne started off asking her about John Ford; her response: “I thought I was here to talk about me.” Fabulous, and with a gorgeous Irish lilt. After that, Robert’s planned list of questions fell by the wayside as Maureen clearly had her thoughts on the end of life, the comfort of her faith, and the importance of joy, especially in later life. It wasn’t necessarily what you’d expect of a guest appearance, but the audience didn’t care. I felt privileged to have seen her at all, and heard what she wanted to talk about, and in a way it was refreshing to have that instead of yet another response to “what was it like to work with [insert director and actor].” It also set the mood well for the pleasures of How Green Was My Valley, which deals with the nostalgia, joy, simple pleasures, and hope of a Welsh coal mining community in the face of everyday danger and death. They say you can’t go home again, but that’s exactly what our narrator, an aging Huw Morgan, is attempting to do as he begins telling of his boyhood. “There is no fence nor hedge around time that is gone. You can go back and have what you like of it, if you can remember. So I can close my eyes on my valley as it is today, and it is gone, and I see it as it was when I was a boy.” It’s not so simple as that, of course, because memory is always clouded, nostalgia always affecting how you want to remember things. This voiceover narration starts off (and ends, quite frankly) a bit on the sentimental side, but the film quickly earns its sentiment. I recently defended the film against its reputation as “the film that stole Citizen Kane’s Oscar,” and while I think there’s an interesting historical discussion to be had on why it did win Best Picture, I’m going to save that and focus here on the aspects of the movie that particularly grabbed and moved me. Though it seems at first that the story is going to largely be about labor troubles at the mine and the generational conflict it sparks within the village as a whole and within the Morgan family in particular, that quickly becomes merely one thread in a tapestry of life that’s becoming unwoven. The miner’s life is romanticized to a great degree here, at least before pay cuts and unemployment make the family trade untenable for the younger Morgans, but it’s all part and parcel of the main theme of the world changing and the things that are inexorably left behind. 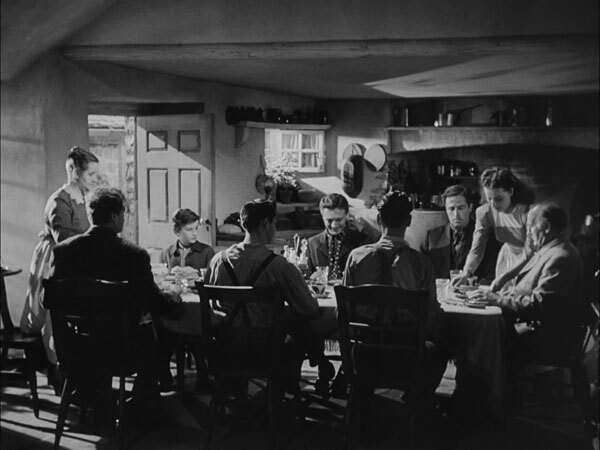 That theme is mirrored by Huw growing up and losing his innocence in a number of ways – a near-tragic accident involving him and his mother, his brutal schoolboy experiences, the eye-opening way women who dare transgress the strict morality of the village deacons are ostracized (a fate that eventually threatens his own sister), the loss of a brother to the mine and his subsequent stepping into the role of provider for his widowed sister-in-law, and eventually, via his adult voiceover, following his two other brothers in leaving his home village and family altogether. The seemingly unfocused structure allows the story to meander from vignette to vignette and ends up building to a highly effective collage of lived experience. The events described above make the film sound like a relentless downer, but as with any good slice of life film, there’s more than enough humor and inspiration to balance it out. One of the funniest sequences follows one of the most harrowing: When Huw starts school, he’s mocked as a coal miner’s son (even by the teacher) and when he gets in a fight, the schoolteacher savagely whips him, leaving his back raw and bloody. Huw refuses to let his brothers go defend him, but the pair of town drunks (who also happen to be former boxers who taught Huw how to fight in the first place) have no compunction and challenge the teacher to a boxing match the next day in his classroom – Marquise of Queensbury rules! 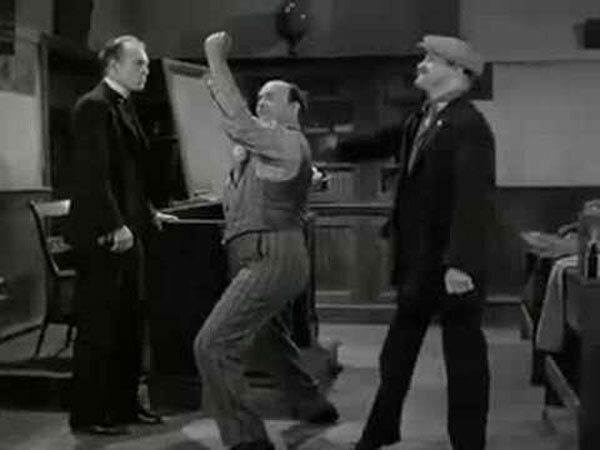 This sequence is immensely satisfying and funny thanks to the two wonderful character actors playing the drunks (Barry Fitzgerald and Rhys Williams), and while the sting of Huw’s treatment remains, balance is regained. There’s also a wonderful little sequence when Huw is studying for his exams and Mr. Gryffudd the pastor (it’s pronounced “Griffith” – that’s Welsh for you) is helping him with his math. Mr. Morgan is trying to be supportive even though he hasn’t had much schooling. Mrs. Morgan, however, is hung up on the impracticality of the word problem being studied, which has to do with a couple of different people putting water at different rates into a tub with a hole in the bottom, draining water at yet another rate. Mrs. Morgan thinks they’re all silly for continuing to put water into the tub in the first place without fixing the hole first. It’s a funny and endearing peek at how dumb math can be sometimes, and yet how abstract thinking sometimes requires leaps of logic (or at least, it does with poorly written word problems). Speaking of the character actors, this film is full of them, and they’re all memorable in that way that only character actors can be. 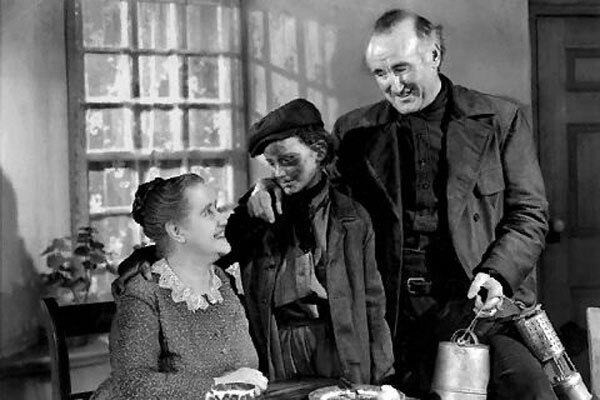 Donald Crisp plays Mr. Morgan with a great deal of nuance, which is rather unsuspected after the curmudgeon he seems at the beginning of the film. He is old-fashioned, to be sure, but he also wants the best for his children, and it’s easy to see by the end why Huw loves and respects him so much. 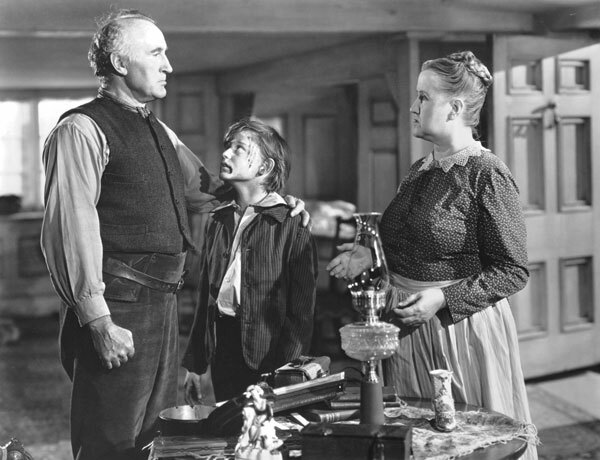 Crisp made a career in the ’40s of playing this kind of father character (see also Lassie Come Home and National Velvet), but Mr. Morgan is probably the most well-rounded and most central to the story. Lest you think this is all Crisp could do, think back to 1919’s Broken Blossoms, when he terrorized Lillian Gish as the alcoholic and abusive Battling Butler. Mrs. Morgan is played by the wonderful Sara Allgood, who exudes warmth and love, but also clearly runs the household – all the men return from the mine with their wages and drop them into her open skirt, and she lets nary a tuppence get by. 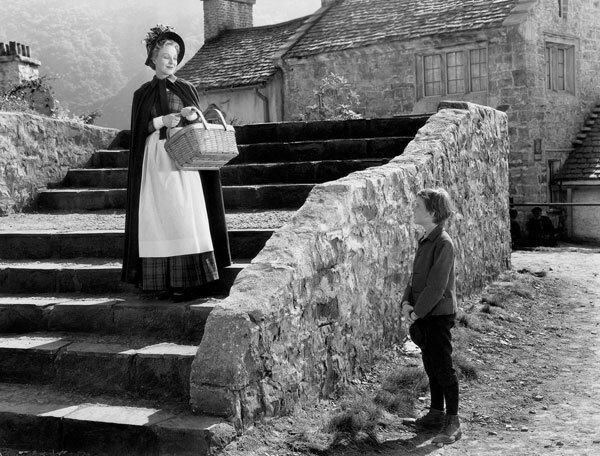 When the mine workers threaten Mr. Morgan for opposing the strike, she goes out in freezing weather to warn them off her family, and her diatribe is successful. On her way home, however, she falls into a frozen stream along with Huw, and they’re both laid up for months – the lack of Mrs. Morgan’s presence in the home is felt acutely, even though none of the characters say much about it. I’ve already mentioned the humorous touches brought by Barry Fitzgerald and Rhys Williams, and it’s worth noting that they’re also capable of bringing the pathos when necessary, as it is toward the end. Very few people are one-note here. One of the few who is one-dimensional is the head deacon, Mr. Parry (Arthur Shields). He is an evil little troll who roots out sin in others but fails to see the wretchedness of his own soul. He is the stereotypical literary puritan, who, as H.L. Mencken wrote, is beset by “haunting fear that someone, somewhere is happy.” He takes fiendish glee in humiliating a woman who has a baby out of wedlock, unwilling to listen to the more moderate pastor (Walter Pidgeon) or Angharad Morgan (Maureen O’Hara) when they point out there must’ve been a man involved in this sin as well. 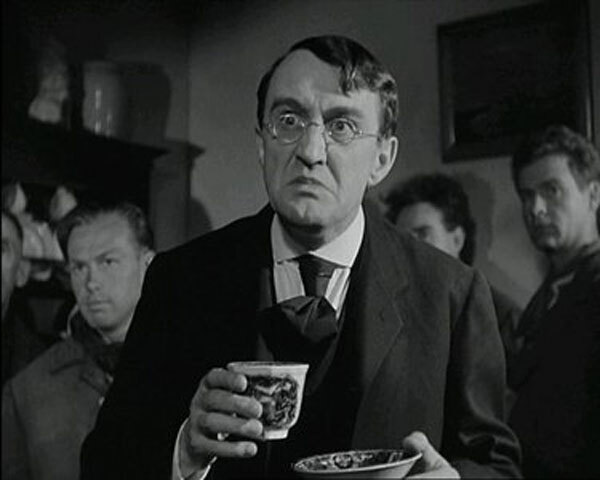 From a meta perspective, this character confused the crap out of me, because, well, he looks like Barry Fitzgerald. I literally spent half the movie trying to figure out how the amiable drunk could be the same guy as this pathetic creature. Turns out Barry Fitzgerald (who I knew from plenty of other films) and Arthur Shields (who I didn’t) are brothers and bear a resemblance to each other. Way to be confusing, casting director. 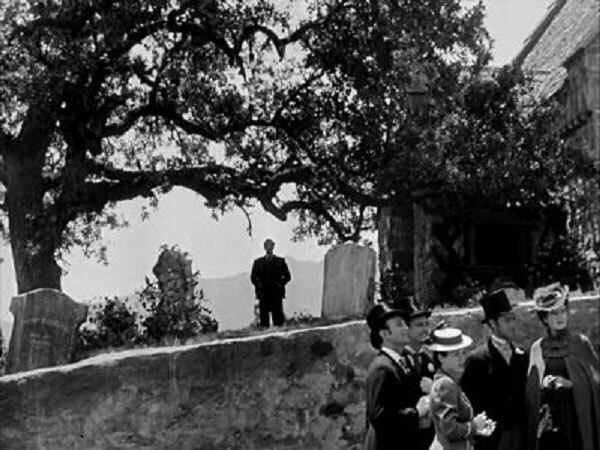 Mr. Gryffudd is the new pastor in town at the beginning of the film, and a quick friend of the Morgans. He’s easily the most important non-Morgan in the film, from his first appearance at the wedding feast of the eldest Morgan son (at which he shocks and pleases the villagers by joining with them in their revelry instead of calling them out for drinking too freely – clearly they were expecting another Mr. Parry) to his support, both physical and moral, of Huw during his convalescence, to his romance with Angharad. He’s also the most consistently wise character in the film, which is something I rarely expect out of pastors on film, who usually become scapegoats for religious extremism. Here Mr. Parry carries that role with all-too-eager aplomb, and Mr. Gryffudd is thankfully the voice of reason and moderation, yet always with a true reliance on his faith underlying his statements and actions. Not to say that Mr. Gryffudd is perfect or always right – he’s pretty clearly wrong in how he ends things with Angharad, but his foibles make him real. The film is really an ensemble piece, but Huw and Angharad clearly take the lion’s share of the plot and emotional weight of the film. Roddy McDowall brings a wide-eyed innocence, and sometimes a deer-in-headlights arrest to Huw, which at first seems a bit precious but ends up working well. 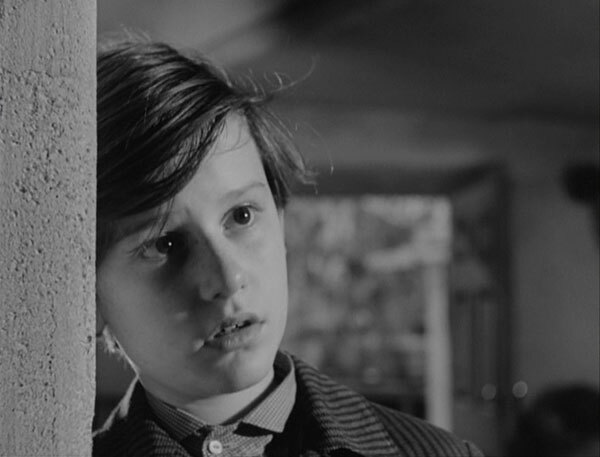 Over the course of the film, Huw is meant to age at least a few years, from a boy of seven or eight bright-eyed at the prospect of being given a bit of spending money to buy candy, to a young man entering the family business and vowing to provide for his brother’s widow. McDowall obviously didn’t actually age during the making of the film, but he makes you feel Huw’s growing maturity as life throws him suffering and joy. 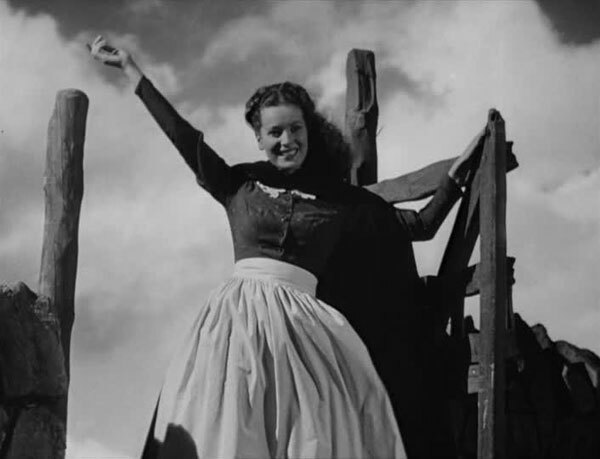 Meanwhile, Maureen O’Hara is known for her fiery red hair in her later Technicolor films, but I don’t think she’s ever been more beautiful or more lit from within as she is here. 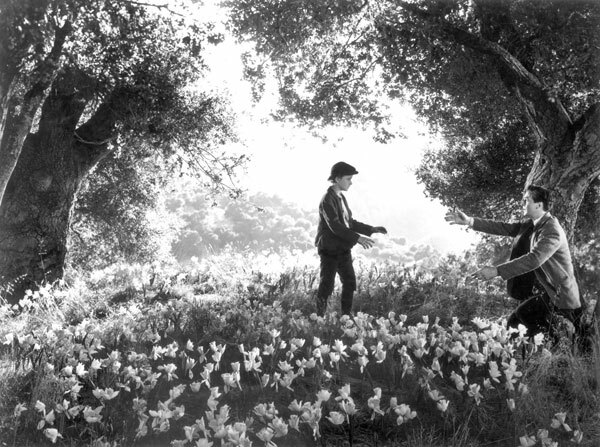 Of course, the gorgeous black and white cinematography by Arthur C. Miller doesn’t hurt – the light caresses her throughout the film. Her Angharad is doomed to thwarted love, but until then she’s the most vital person in the village, often barely able to keep her mischievous expressions to herself even if she wanted to and unafraid to come out against Mr. Parry or Mr. Gryffudd anytime she thinks they’re wrong. Her fate is the most heartbreaking and in a way the least believable, and yet, when someone loves so fiercely and is denied (for noble-sounding but ultimately stupid reasons), you can see how badly she’d be broken. You can tell pretty quickly from the names I’ve dropped throughout that they didn’t de-Welsh-ize the names at all. Angharad, Gwilym, Huw (Hugh), Mr. Gryffudd (pronounced Griffith), and others I didn’t mention like Ianto, Cyfartha, Ceinwen, Iestyn. Now, they didn’t actually cast any Welsh actors, in lead roles at least, and not all the accents are perfect, but I greatly enjoyed hearing all the unfamiliar names, which roll off the tongue much better than they look like they would. The user-submitted story synopsis on IMDb focuses almost solely on how hard a life the Morgans have, how dangerous the mine work is, and how they hope for a better life for Huw. All that is true, but so much of this story is about finding joy within hard times. Getting that first little-boy crush on your brother’s fiancee. Laughing with friends and family at a wedding feast. Running to the candy store with your allowance. Enjoying mounds of adventure books while waiting for a long winter of convalescence to end. Seeing the bird at the window that means spring is here. Having someone else believe in you more than you do in yourself and making great strides because of it (yes, that was a terrible pun, if you’ve seen the movie; I apologize). Experiencing those first flirtations as a young man and woman start shyly probing each others’ feelings. Enjoying a well-portioned, hearty meal with your family. Earning your father’s approval. Hearing your parents playfully jab at each other over silly math problems, as only old contented married couples can do. Of course, there is a lot of sorrow, as well. 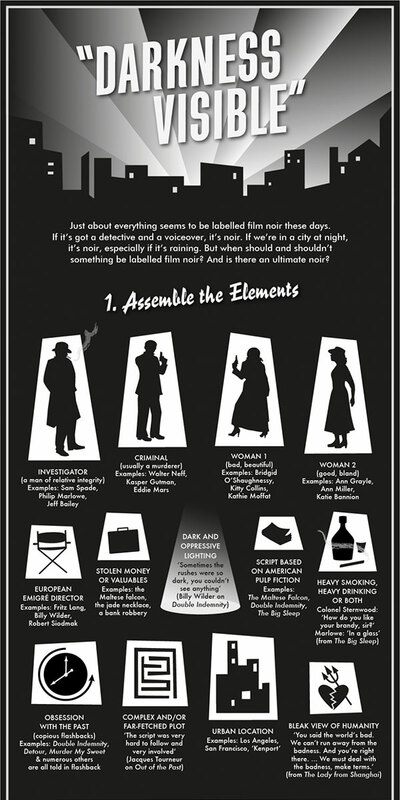 Mines ARE dangerous places, and tragic things do happen in the course of the film. That’s not sugarcoated, though the nobility of mine work is probably overstated to some degree. The family is split up due to the lack of work in the village, and the brothers who leave for America or Canada are never heard from again. Huw’s exposure to the cold river nearly leaves him crippled for life. The school scenes, as I’ve detailed, are horrific. 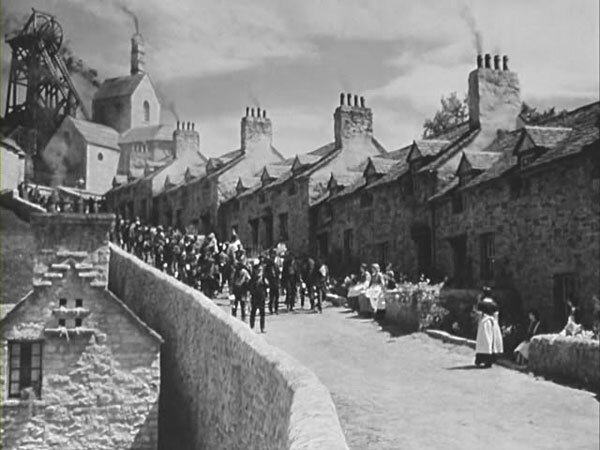 The bookending narration has a melancholy edge to it, bemoaning many of the troubles that came in the wake of the mine wages falling (though many of the sorrows had nothing directly to do with that), and yet the film ends with a deep nostalgia – “how green was my valley then,” the adult Huw muses as images of happiness fill the screen at the end of the film. The thing is, life is filled with sorrow AND joy, and they go hand in hand far more often than fiction usually suggests. How Green Was My Valley is rather in the poetic realist tradition, and emotions are heightened, and yet the depiction of the daily sorrows and joys, some big and some small, of life in this coal mining village also feels very real. 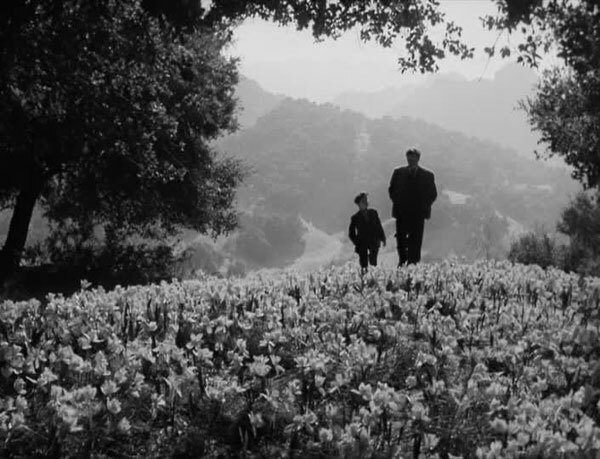 In the romantic, poetic realist tradition, you’re not going to find a more fittingly and loving photographed film than How Green Was My Valley. 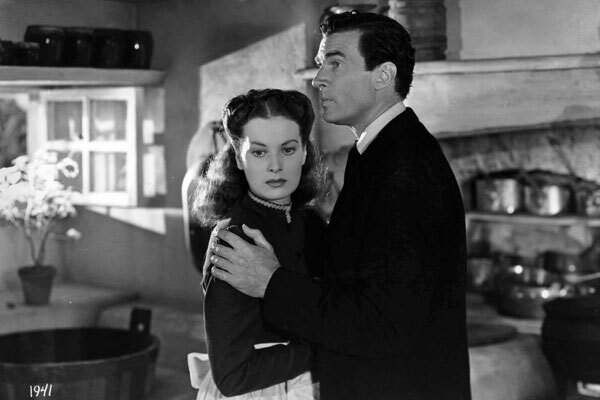 It’s not particularly moody or high-contrast, and thus not as flashy or noticeable as a lot of the later ’40s noirish films, but I already mentioned how lovely it touches Maureen O’Hara. 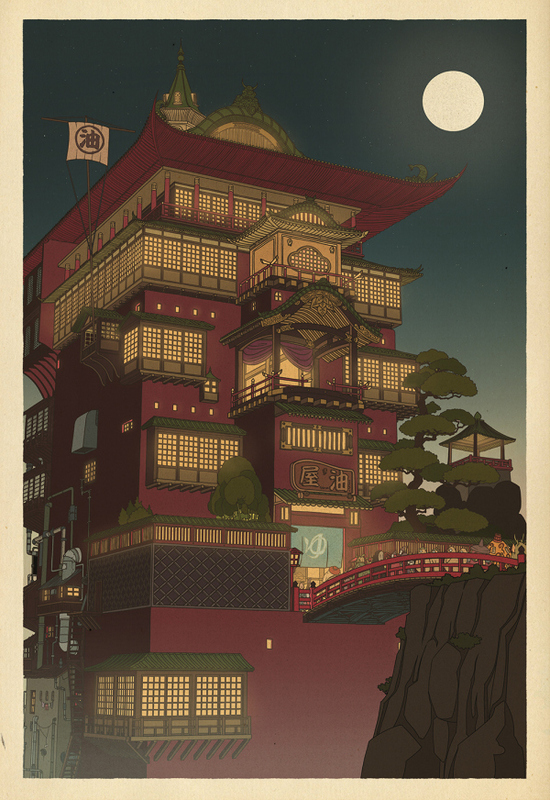 The lighting as well as the composition in general is just as lovely throughout. 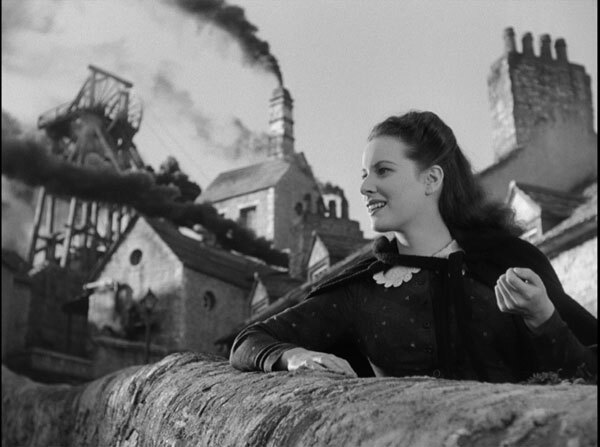 The silhouettes of Mr. Gryffudd and Huw on the flower-strewn hillside and later Mr. Morgan and Huw on the same hill, the lines of coal miners returning from work singing hymns, Angharad in front of the row of houses with smokestacks belching behind her (a study in beautiful contrasts), and later Angharad waving happily from the gate – basically, most of the shots I’ve included in this post, these are all stills that are well-known and easy to find online, because it’s difficult to choose just a few stills to represent this film. Firstly because it does have so many different moving parts, but also because there are just so many beautiful shots that I and apparently a lot of other people who illustrate their posts with screencaps can’t bear to leave any out. So here are a few more, for good measure. So much of the Welsh identity has been linked to coal mining that even today, years removed from the heyday of many of those communities, it looms large. I’ve not seen the film yet, but based on my admittedly limited working understanding of Welsh history and culture, I suspect that many would balk at the very idea that this, or any film, could “overstate” the nobility of mining work. Growing up in Kentucky, even in an area not directly connected with mining, I have an informed sensibility about what the mining culture is like, and how whole communities can be devastated by anything from an accident to a strike, or a mine closure. They’re a special breed, miners, and the pride they take in their work really is hard to overstate. I think it’s because, let’s face it, few people who didn’t have to do it would take it up in the first place, and no one could keep doing it without a certain kind of pride. I mention this because, as you know, I’m wont to analyze a narrative in its proper geo-historical context. I’m also keen on considering the time of the film’s release, and I have to believe that this film, based on your loving descriptors, resonated viscerally with audiences limping out of the Great Depression and into World War II. I’m also reminded, rather vaguely, of Ryan’s Daughter from some of the themes you’ve mentioned. I’ve seen that film twice, though it’s been probably 15 years now. When I eventually get around to seeing How Green Was My Valley, I may revisit Lean’s picture for contrast. Thanks for the comment about the pride of coal miners. I think because I haven’t had a connection with it, it’s harder for me to understand, and for a lot of other reviewers, too. I didn’t look up other reviews while working on this, but I saw some synopses, etc. while I was fact checking, and most of them mentioned how the family hoped for a better life for Huw. [Spoilers] It’s sort of true – they do send him to school, which I think they weren’t able to do for the older boys, but at one point he’s given the choice to go off to boarding school to continue his education and become whatever he wants or to stay and follow his father and brothers in the mine. He chooses the mine, and even though his father makes sure he’s really sure and knows what he’s giving up by not continuing his schooling, his family all seem pretty proud that he’s chosen the mine. I get that as a part of the narrative, but I don’t really understand making that choice in a real-life type way. If I personally had that opportunity, or my son did, there’s no way I’d pass it up. But the film unequivocally supports Huw’s decision. My comment on the film overstating it is more a matter of tone, in that the film is very much in a romantic tradition that glorifies the common man. Not that there’s anything wrong with that, and not the common man doesn’t deserve attention and importance, but this ain’t Harlan County, U.S.A. The realism is really tempered with romanticism – I like it that way, but I can definitely see modern audiences being put off by the overt sentimentality. It’s difficult to have a meaningful discussion about something one hasn’t seen, for obvious reasons, so I’ll leave you with this to consider: If the film doesn’t romanticize that pride in mining, can it still sell the character decision to pass up education and opportunity? Speaking to that choice itself, which people face in various forms every day, I was pretty confused by it in my youth. As I’ve aged (“grown up” seems misleading! ), I’ve come to have a more nuanced appreciation for the way that different things can tug and pull at a person that may lead them to making a choice that looks pretty bad on paper. Wanting to be part of a culture you’ve grown up in and around – particularly one in which everyone close to you has been directly involved for generations – can be irresistible. It’s why in 2014, there are still people going into mines, and taking on their family farms and ranches. From your description of the film, there’s really no other choice that Huw could have made without the film ultimately being read as dismissive of that cultural heritage. No, the film does exactly the right thing for the film, both in having Huw make that choice, and in romanticizing it so we believe it’s the right one. It works perfectly in the film – but the film is inherently a romantic one from frame one. I think you could make a film that doesn’t romanticize it and problematizes Huw’s choice and that could be a good film, too. But it wouldn’t be this film. Perhaps I’m influenced the opposite way in real life because my dad came from a family of farmers and while he loved his family, he left as soon as he finished high school, went to college and became a computer engineer. Not that that’s inherently any better than staying on the farm, but my life has been profoundly influenced and shaped by the fact that my dad did what Huw did not. But this was in 1950s middle America, not turn of the century Wales, which probably makes a big difference already. Great article! Really enjoyed reading that.